圖1、(a–f) The ISUAL recorded image sequences for a halo event at universal time 0626:38.806 on 31 July 2006. The exposure time of each frame is ~30 ms. The halo has a diameter of ~80 km, and its apparent height is at altitudes of ~80–90 km. The average and maximum brightness recorded by the ISUAL Imager is 0.24 and 0.72 Mega Rayleigh (MR). 圖2、The N2 1P, 2P, N2+ 1N, and O I (777.4 nm) from SP photometric readings for the halo event at UT 0626:38.806 on 31 July 2006. 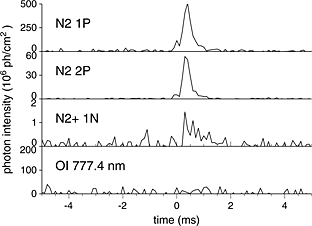 The clear signal for the O I (777.4 nm) channel of SP indicates no lightning contamination. The recorded signals for N21P, 2P, and N2+ 1N exist solely from the band emission of halos. 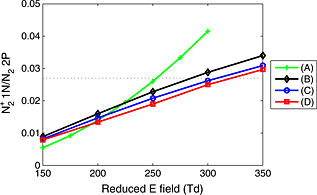 圖3、We compare the observed ratios of N2+ 1N to N22P emissions with the theoretical calculations from the ratio for the excitation rates of N2+ 1N to N22P bands from (A)Moss et al. and (B) Sentman et al. . For a more detailed analysis of the temporal evolution of excited bands, we consider the zero-dimensional models: (C) simple analytic model and (D) plasma chemistry model [Sentman et al., 2007; Kuo et al., 2011; Kuo et al., 2012] with the applied different reduced electric field and find a reasonable magnitude of reduced electric field in the halo region for the reported halo event. The dashed line indicates the value 0.027 derived from the SP photometric readings.